Writer Ivan Brandon (Wolverine, Men of War) and artist Nic Klein (Captain America, Thor), paint a dark and eerie alien landscape in their forthcoming series DRIFTER, which was first announced at Image Expo preceding San Diego Comic-Con this year. Becky Cloonan lends her interpretation of DRIFTER to issue #2 as a blue-toned variant cover that displays her characteristically humanistic take on character design. The ongoing series launches with issue #1 on 11/12; issue #2 lands on 12/17. In DRIFTER, mankind has spread across the universe in a frantic rush to survive and has colonized and strip-mined countless planets in the process. Abram Pollux barely survives a crash landing on Ouro, a lawless backwater world where life is cheap. This world’s unique properties set the stage for a story that combines the dark wonder of an alien landscape with the struggles of an abandoned and lawless frontier town. DRIFTER can best be described as Unforgiven meets Dune and boasts strong, stark revenge themes against a layered world-building backdrop. 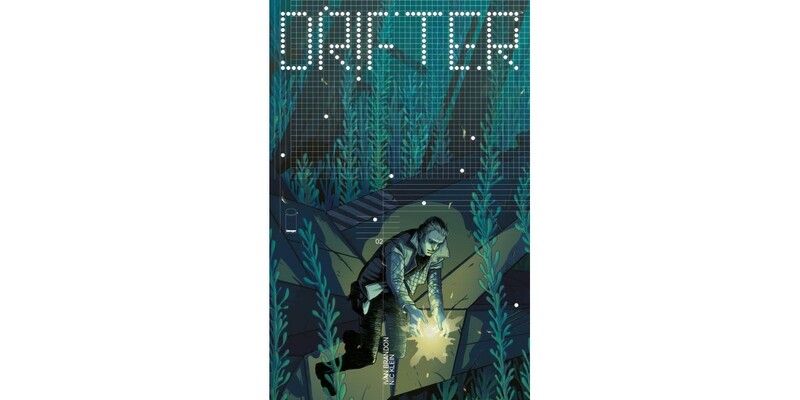 DRIFTER #1 is available on 11/12 and Cover A by Klein can be pre-ordered with Diamond Code SEP140546. Cover B featuring artwork by Esad Ribic can be pre-ordered with Diamond Code SEP140547. Cover C with art by Cliff Chiang can be pre-ordered with Diamond Code SEP140548. DRIFTER #2 hits stores on 12/17. Cover A by Klein can be pre-ordered with Diamond Code OCT140736. Cover B by Cloonan can be pre-ordered with Diamond Code OCT140737.